A wonderful exhibit of quilts has just arrived at the Philadelphia Museum of Art. The Quilts of Gee’s Bend. It is an extraordinary exhibit and an extraordinary tale. 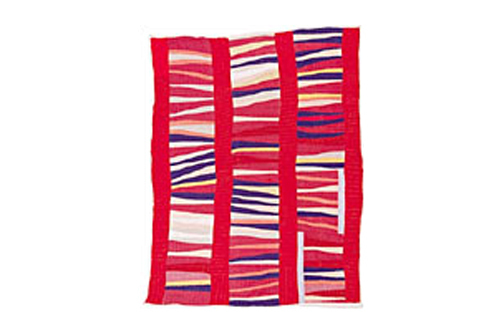 Over 60 quilts by 42 women spanning four generations. What a wonderful legacy. It always amazes me that fabric survives so well for so long. It is such a fragile material. Water, mildew, bugs, sun and chemicals, not to mention washing and wear all threaten to destroy fabric. Therefore, I am always fascinated when we find treasures so well preserved that they are able to tell us about our culture, our history, and ourselves. Remember the old cotton commercial slogan. “Cotton -the Fabric of our Lives.” They certainly got their money’s worth from Madison ave on that one, by the way. But whether it is cotton, silk or polyester, fabric is in our lives every step of the day. From our bed sheets to our clothes, our curtains to our cushions and to our tents to our sails. We can not get through the day without fabric. What fabrics do we save? Is it our favorite dress that we save or do we wear it out and only the special occasion dress that is hardly worn, is stored and saved away for the next generation to discover? I collect antique tablecloths and it tends to be the ones that never got used that survive the ages yet have little to tell about their owners other than the item was treasured. The overly used and loved items often pass away along with their owners due to old age. Have you saved anything? Your Wedding Dress? A Christening gown? An Army uniform? Or A Baby Blanket? Add a little note about your, the item, how and when it was used. Seal it in a plastic bag and place it with your treasured item. It is a good way to preserve the story of your fabric.